I had such grand plans for tonight. I was going to work late and get a project logged so that I could write it tomorrow – it had been scheduled to air next week but is now running this Thursday.. I was going to relax.. cook myself dinner.. write another post.. attend a meeting for a business I’ve gotten involved with on the side, one I’m pretty fired up about.. and run by Barnes & Noble quickly to pick up some things I didn’t get a chance to really look at last night because I ended up talking for a long time with my ex husband about some big issues .. issues we’ve been trying to find time to talk about now for months. Years is more like it. With our daughter at an unexpected sleepover, I found myself with the time and mental wherewithal last night to offer up the time to meet. SO.. instead of browsing, I set the stack of books/magazines on hold behind the counter last night as the store closed, because the ex and I were two of the last still there wrapping up our conversation. I’m guessing this is shocking to any of you who know us, because I’d say as recently as 6 months ago, us sitting at length to talk about anything was just not going to happen. Then, I was hoping to sit down and have some good quality quiet to time to call the Cowboy before going to bed at a decent hour. I’m not quite sure what ‘at a decent hour’ means anymore. And they – *they, the neighbors just wrapped up a long conversation with the Cowboy, thinking my video phone was a pretty cool toy to be able to chat with him and feel like he was here in the living room with us. I still have yet to really download with him today. 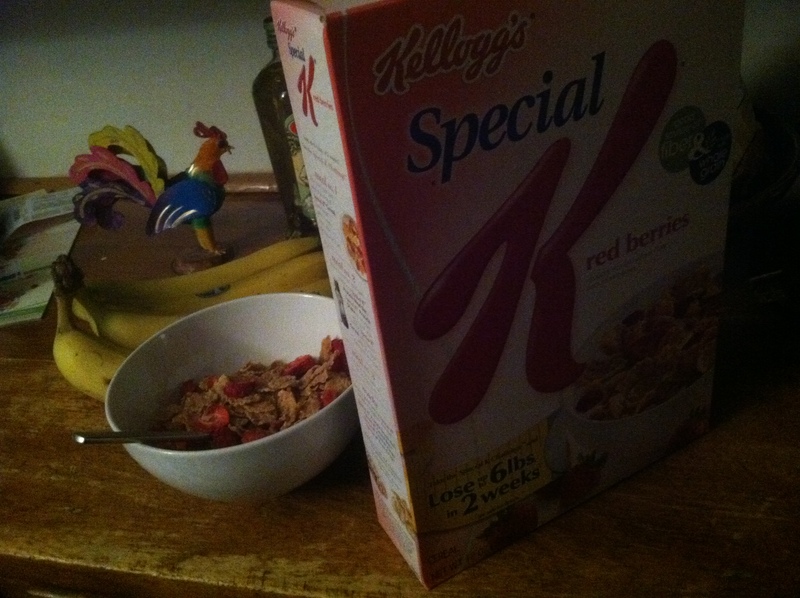 I opened up a box of Special K with strawberries and poured myself a bowl. I laughed at the thought I might get to bed early. And I started to type. Going to bed at ‘a decent hour’ won’t happen, once again. But that’s ok. It was a long day for the Cowboy as well. He was up and out the door early today to shoe (horses) with a couple hours on the road between clients. He looked tired tonight. I imagine by now, he’s sleeping. I’ve been thinking all day about how I was going to blog about the conversation my ex and I had last night and again early this morning and talking with the Cowboy about it all. I’m putting it off for now. But I will write about it at some point soon because the reasons for why we needed to talk won’t change anytime soon. Quick synopsis though: We are talking about school next year, our hopes for her future as well as our hopes for us as her parents, and does her current school track fit the track we want for her. Plus, if either of us moves anywhere in 2012, what will that mean for her, us and our current custody arrangement. You know, those things. Big things. It’s a huge conversation the Cowboy and I are having as well, perhaps along with many of you out there. What is best for our kids? What does that look like? And what does that mean for any of us? The Cowboy and I .. my daughter .. and .. I now know, even her dad, we are all sending up a lot of prayers. Especially because the ex always likes to have things planned out. But making and keeping plans versus being ok with any change in plans is a dynamic many of us have to work through. It was among the many differences the ex and I had. Not bad, just different. Being ok with change is something the Cowboy and I, I have to say, are pretty good at. And its important to me to always be flexible. Because things rarely go as I plan. Looking forward to an early start tomorrow. This entry was posted in Uncategorized and tagged Cowboy, Dating, Parenting, Relationships, South Dakota by Carleen Wild. Bookmark the permalink. Mmmm… cereal for dinner, you’re a woman after my own heart! Sounds like you’ve got quite a bit going on in Wild World, I am pulling for you but know you’ll ultimately land on your feet regardless of where the wind blows. You’re resiliant, and you’ve got a Cowboy – that’s a recipe for success in the making, regardless of where the adventure takes you. Hugs! Nate, miss you! And thanks so much for the feedback! Your thoughts mean a great deal to me.. sincerely. Now where best to keep caught up on you? How is new life back out east?